Financial Times profiles Avi Turgeman, founder of BioCatch. Metro Bank to deploy workforce management technology from NICE. Let’s Talk Payments interviews OneVisage founder, Christophe Remillet. Darwinex reveals winners of its DarwinIA Trading Challenge. Synergix features CashSentinel (in French). Siam Commercial Bank deploys Ripple technology for cross-border payments between Japan and Thailand. Starting today, mobile payments escrow service CashSentinel is available in France. The new launch is made possible by a partnership with SFPMEI, a French electronic money-issuer. This is CashSentinel’s first expansion outside of Switzerland, where it has been operating since 2012 in partnership with pre-owned vehicle-ad platform AutoScout24 and Swissquote bank. CashSentinel’s mobile escrow service offers a safe place for two parties to buy and sell new and used vehicles (check out our in-depth review of the platform). Since launching in Switzerland, CashSentinel has protected payments for hundreds of parties. In June of last year, the Switzerland-based company closed a seed funding round of an undisclosed amount. Prior to this round, CashSentinel had raised a total of $650,000 in seed funding and grants. The company was recognized as a Regional Finalist in the 2015 UBS Future of Finance competition. CashSentinel’s CEO Sylvain Bertolus and Board Director Michael Chaille debuted the Large Amount Payment Service at FinovateEurope 2015 in London. Poland’s mBank elects to focus on HCE for mobile payments over NFC. Spain’s BBVA upgrades its ATM network to enable cash recycling. TechCrunch features multiple Finovate and FinDEVr alums in its recommendations of financial products for the gig economy. CereTel, selects Cachet Financial Solutions to develop, deploy and manage new prepaid mobile banking platform. Lendio partners with SBE Council to offer its lending resources to SMB owners. Tradeshift announces MetaProcure as reseller. First National Bank to install Insuritas insurance agency solution for its customers. SayPay Technologies, Stratos, and Wealthforge will compete for top honors at the UBS Future of Finance Challenge on 10/December in Zurich. The three will join nine other finalists vying for $50,000, 300+ hours of mentoring, and the opportunity to develop their technology in a UBS innovation center. All three Finovate alums reaching the finals made their Finovate debuts at FinovateSpring 2015 in San Jose. SayPay Technologies, a finalist from the Singapore round, will go into the finals with its Customer Authentication Experience. SayPay CEO Steve Hoffman said, “The distinguished panel of UBS judges was quick to recognize how SayPay transforms fragmented current authentication solutions into a seamless, enjoyable customer interaction with their financial institutions.” SayPay was founded in February 2014 and is headquartered in Pleasanton, California. 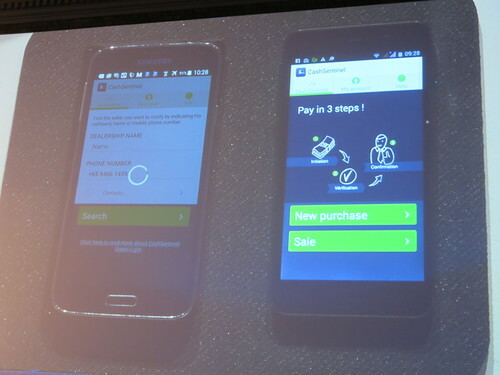 The company launched its BillPay and Secure Web Sign-In at FinovateSpring 2015 in May. Stratos presented its wallet-simplifying, Bluetooth Connected Card with enhanced security, and emerged from the same New York round as fellow Finovate alum, Wealthforge. 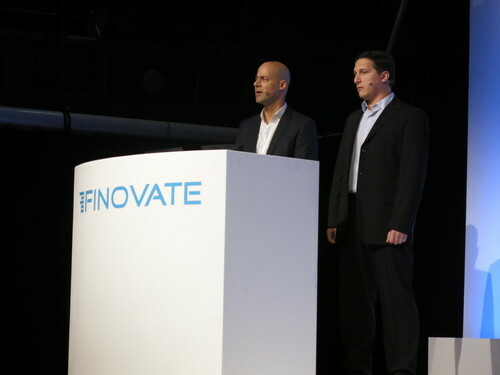 Stratos demonstrated its technology at FinovateSpring 2015 in May. It was founded in 2012 and is headquartered in Ann Arbor, Michigan; Thiago Olsen is CEO. Wealthforge impressed UBS judges with its automated, integrated risk management solution for issuers and intermediaries. Mat Dellorso, CEO and co-founder, wrote at his company’s blog: “With the WealthForge Invest Button, anyone raising private capital can take advantage of an intuitive, modern approach to managing the process of raising more capital in less time.” Wealthforge was founded in 2011 and is based in Richmond, Virginia. Wealthforge gave Finovate audiences a look at the Invest Button during its demo at FinovateSpring 2015. Also competing in the New York round were Finovate alums, MaxMyInterest and Coinalytics. FinovateEurope 2015 veteran CashSentinel represented Finovate alums in the Zurich round. European fintech fans! Join us in February as Finovate returns to London for FinovateEurope 2016. For more information, and to save your spot, visit our FinovateEurope page. Earlier this year, CashSentinel launched its mobile payment escrow service to the public in Switzerland. The startup aims to create a safe environment for two private parties to buy and sell used vehicles (check out our in-depth review of the platform). The startup announced today it closed a seed round of an undisclosed amount. Investors include Business Angels Switzerland (BAS), GoBeyond, and other angel investors. Since it was founded in 2012, CashSentinel has received a total of $650,000 in seed funding and grants. Today’s seed round brings the company’s total funding somewhere north of that figure. In January, the fintech company made its service available on the website AutoScout24, an online European marketplace for used vehicles. Since then, CashSentinel has seen a steady increase in transactions and recently exceeded $1 million (1 million CHF) processed on its platform. CashSentinel expects its growth to burgeon in the future, as more than 500,000 used vehicles trade hands every year in Switzerland alone. The startup plans to expand into the greater European market later this year. CashSentinel debuted at FinovateEurope 2015 in London. The company holds partnerships with Swissquote Bank and AutoScout24. Dunkin’ Donuts, Fandango, Sundance Catalog and Williams-Sonoma now accept Visa Checkout. Moven updates Android mobile app. The Fintech blog features Q&A with LendUp CEO Sasha Orloff. Westpac Banking Corporation and New Zealand Banking Group are testing Ripple for payment transfers between subsidiaries. Ixaris announces €4m Open Payments Ecosystem (OPE) project to support developers building payment apps. TSYS to support Apple Pay when it launches in the U.K. in July. Omnichannel account-opening solution from Zenmonics goes live at BBVA. Austin Energy to adopt PaySecure platform from Acculynk. Investopedia column on the “Top 5 Myths of Robo-Advisors” features Betterment, Wealthfront, and Vanguard. BrightScope launches Fund Pages to provide detailed information about open-ended mutual funds. Sam’s Club using Lending Club to offer financing to SMB customers. FitSmallBusiness.com names OnDeck best provider of small business loans. SunGard terminal selects Heckyl news and sentiment analysis. Pindrop Security granted patent for phone antifraud and authentication technology. Top Image Systems taps Bob Fresnel as new TIS Americas President. CashSentinel enables people who do not know or trust each other to instantly and safely exchange a large amount of money, using their mobile phones. The Switzerland-based company’s platform works similar to an escrow service combined with a mobile wallet that transfers funds in real-time. Since neither party needs to carry cash, exchanging money for a vehicle is safer. The system has built-in accountability. The buyer cannot incorrectly claim they sent the payment and the seller cannot incorrectly claim they didn’t receive the payment. After both parties have registered on the web or mobile platform, the transaction can take place either on the CashSentinel mobile app (available for iOS or Android), or via SMS; there is no need for a smartphone. In the following example, a private party sells a used car to a private buyer; however, CashSentinel also works for small, commercial sellers and is not limited to vehicles. After the buyer registers online, CashSentinel verifies their identity by mailing them a secret word, which they will use later in the transaction (see step 4). Once the potential buyer finds a vehicle they’d like to purchase, they load the required amount of money onto the CashSentinel platform. If they decide not to purchase the vehicle, they can recoup the money in full. After the buyer loads the funds onto CashSentinel, they enter the seller’s phone number. This prompts CashSentinel to send the seller a push notification that the funds are ready. To ensure that the buyer is serious, CashSentinel enables the seller to verify that sufficient funds have been loaded onto the platform (see below). When the parties meet in person to exchange the vehicle and agree on a price, they transfer the payment. They consent to the exchange by entering each others’ private, six-digit code (see below). After the buyer and the seller exchange their 6-digit codes, both need to finalize the transaction by confirming the amount. To do so, the buyer enters the secret word received in the mail. CashSentinel transfers the funds from the buyer to the seller and the transaction is irreversible. Because funds are transferred instantly, the buyer drives away in the vehicle with the seller knowing the funds are good. The service is entirely free for the seller. The buyer pays a tiered flat-rate that varies by the purchase price of the item. CashSentinel currently works only in Switzerland, but the company plans to expand operations into the European Union later this year. CashSentinel demonstrated at FinovateEurope 2015 in London. This post is part of our live coverage of FinovateEurope 2015. CashSentinel debuted its escrow service and mobile wallet combination. Online secondhand-car fraud was the #2 most common online scam in 2013, according to the European Consumer Centers network. This market represents over 25 million transactions yearly in United Kingdom, France, Germany, Italy, and Switzerland alone. CashSentinel developed a solution that combines an escrow service and a mobile wallet, dedicated to facilitating and bringing trust to large transactions between parties that do not have a long-lasting, trusting relationship. CashSentinel concluded a partnership with Swissquote Bank, the leading online bank of Switzerland, and AutoScout24, the leading secondhand-car marketplace. After a successful trial period, the service is set for fully fledged launch and European expansion in 2015.